Paramedics across the Maritimes gathered for the first time Wednesday to brainstorm solutions to problems they said they’ve been facing. The discussion was part of a paramedic union conference held in Halifax. Michael Nickerson, president of IUOE 727 which represents paramedics in Nova Scotia, said problems vary from province to province, but there is some overlap. “It’s really a systemic issue,” said Nickerson before the conference. Emergency Health Services N.S. and Ambulance New Brunswick report they each have approximately 1,000 working paramedics. 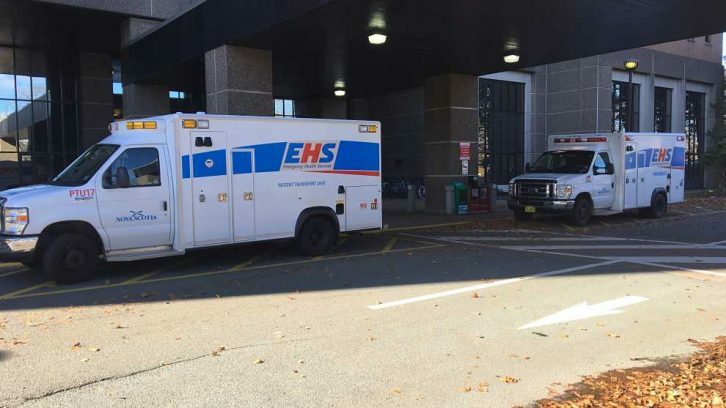 Island EMS, which services Prince Edward Island, employs 150 paramedics. Ambulance services are owned by Medavie Health Services. Earlier this year Nova Scotia paramedics started the #codecritical campaign on Twitter to alert the public of ambulance shortages and highlight one of their main issues: offload delays. Offload delays refers to the time paramedics wait in emergency rooms to transfer patients to the hospital. Other major concerns are bed and primary care physician shortages. According to the Nova Scotia Health and Wellness Department, there is a provincial standard of a 20-minute maximum, for 90 per cent of offloads. In August, most hospitals across the province were unable to meet those standards, the CBC reported. P.E.I. paramedics are also concerned about transfer times. It usually takes eight to 10 hours to transfer patients to larger hospitals in Halifax, Moncton and Saint John. These transfers are usually for cardiac patients as the P.E.I. hospitals aren’t equipped for cardiac imaging. Jason Woodbury, president of CUPE 3324 representing the paramedics of P.E.I., said they haven’t received any additional resources, such as more ambulances, since 2016, yet their call volume has been increasing by 11 per cent per year. Woodbury compares the system to a basket. As for New Brunswick, their concerns lie with accountability. Gregory McConaghy, president of CUPE 4848 which represents paramedics and dispatchers, said New Brunswick’s issues are unique as the only official bilingual province so paramedics are required to speak English and French. After taking an arbitration case to the labour board to soften bilingualism employment rules in New Brunswick, the paramedics won, which should have allowed paramedics to be hired without being bilingual. However, McConaghy said the government isn’t necessarily accepting that result. Although, new New Brunswick Premier Blaine Higgs has said he would consider removing the bilingual requirement if it improved the shortage, with a minority government there’s a lot of pushback on accepting the change. “They just won’t do it; there’s just no accountability,” said McConaghy. Nickerson said the Nova Scotia union has asked the health minister to bring all health-care unions in the province together to brainstorm solutions to their problems. “It has progressively gotten worse and I think we’re at the point now that, before it gets any more drastic, we need to talk about it and try and come up with some viable solutions,” he said. Health Minister Randy Delorey said he’s aware of the paramedics’ concerns and has met with the union and other front-line paramedics. Delorey said the provincial EHS system is being reviewed. If any improvements are made, they will be done within the next five to 10 years. Representatives from all three provinces are hopeful the conference will become an annual event so they can continue to try to improve emergency services across the Maritimes.